Dr. Rock's Blog & Roll: Album of the Day: Aerosmith (5/3/76) 34 Years! Album of the Day: Aerosmith (5/3/76) 34 Years! Aerosmith was rocking the world after their third studio albums, Toys In The Attic reached #11 in 1975 and elevated them well beyond the cult-status they achieved in and around Boston. 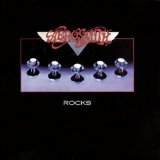 The follow-up, Rocks was released on May 3, 1976, cementing their position in the hearts, minds and ears of global hard rock and early metal fans and becoming the top-selling Aerosmith album in the 70s. And for good reason. Like its predecessor, it’s unabashed, straight ahead rock with all the raw power and raunchy swagger that gushed from Aerosmith in their first decade. Rocks is ranked #176 on Rolling Stone magazine’s Top 500 albums of all time. You can download my Aerosmith playlist in Dr. Rock Playlist Vault and Rocks is available on Amazon but not on iTunes. Rock on!